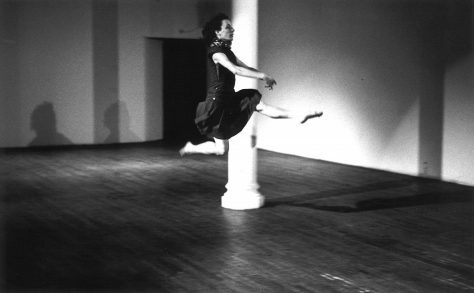 In February 1983, Overlie presented a double bill of multiple pieces including works from her repertoire [Hero (1980), Wallpaper (1979), and Painters Dream (1978)] as well as the premiere of History and several group improvisations. These pieces offered a variety of solo and group dances, encompassing all the elements and influences that characterize Overlie's practice. Hero was performed with a score started by Laurie Anderson and finished by Don Christensen, becoming the first non-silent piece in Overlie's work. These videos were taken in rehearsal at The Kitchen in preparation for the performances.